Ryane Rice is a Marriage and Family Therapy Associate with Wellspring Christian Clinic and is currently living in her hometown of Birmingham, Alabama. 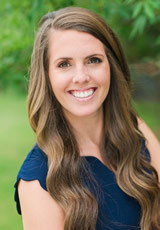 She received her bachelor’s degree in Human Development and Family Studies from the University of Alabama and, following a counseling internship in Colorado, she earned her master’s in Marriage and Family Therapy from Abilene Christian University (Abilene, Texas). Ryane specializes in working with women from pre-teen to young adult on a wide variety of presenting problems, including anxiety, depression, divorce, marital conflict, and pre-marital counseling. In addition, she enjoys working with girls and young women who are struggling with self-esteem issues, identity development, life transitions, trauma, and those who come from at-risk backgrounds. She is a member of the American Association of Marriage and Family Therapy (AAMFT). When she’s not working, Ryane is often home or traveling with her husband Blake, or spending time with their dog, Gracie and their two cats, Baxter and Reggie.